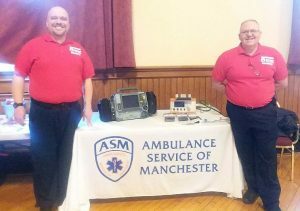 MANCHESTER — On March 31, 2015 seven EMTs were added to the ASM team. As part of our continued growth ASM and Aetna seek out only the best candidates. We look for employees who are focused on high-quality patient care, are team oriented and conduct themselves in a professional manner. During the orientation, employees learn about company philosophy and goals, quality assurance, and policies and procedures. Tiffany George: FULL TIME, EMT. My name is Tiffany and I am 27 years old. I have worked in commercial EMS since 2008 as an EMT and Dispatcher. I recently moved to Manchester with the intention of pursuing a career as an administrative assistant, but quickly learned the position was not for me. I’m glad to have received the opportunity to continue my work in EMS at ASM. I graduated from Naugatuck Valley Community College in 2010 with a degree in General Studies and along with that came my EMT certification. I have also worked as an ER Tech and have received training in phlebotomy and EKGs. I’m hoping to someday attend Paramedic school, but until that time I am a junior at Post University working towards earning a degree in Marketing. I’m a former pageant competitor and titleholder in the Miss America Organization and spend as much time as I can volunteering within the program. I enjoy leading an active lifestyle, as well as meeting new people. In the free time that I sparsely have I do enjoy spending time with family, friends, and my dog, Pippa, as well as baking tasty treats. Robert Grzywinski: FULL TIME, EMT. Hello my name Robert Grzywinski and I am 37 years old. Originally I was born in Wroclaw, Poland an arrived to the U.S at the age of five. My family settled down in New Britain where I graduated from Mary Immaculate Academy. I currently live in Coventry and enjoy the different pace of life. For over ten years I worked with children and adolescents in different capacities, from a direct care counselor in a safe home, extended day treatment, residential, and a day school servicing special education and behaviorally defiant adolescents. For most of my career I have worked to assist others, so it came to no surprise that I went on to obtain my EMT certification through CPR Professionals out of South Windsor and am looking forward to starting an exciting and new profession. In my free time I enjoy do some DIY projects around the house as well as cooking. The rest of the time I spend with my family, barbecuing, going to parks, beaches, attractions for the kiddos or just hanging around the house with them. Christopher Tevnan: FULL TIME, EMT. My name is Chris Tevnan, I am 32 years old and live in Farmington. I went to Bridgewater State University in Bridgewater, MA and graduated with a degree in Aviation. For the last six years I was a Federal Agent with Homeland Security in NYC. It was a great job but I was never home. In January I completed the accelerated EMT course with CPR Training Professionals in South Windsor. I’m excited to begin a new career within the medical field and to be able to really make a difference in someone’s life. My wife and I are happy that I will be around more often especially with our daughter Brooke expected in early May. In my free time I volunteer with the Tunxis Hose Fire Department, spend time with family and friends, BBQ, and do work at our new house. Nora Young: FULL TIME, EMT. My name is Nora Young. I am 21 years old and currently live in Storrs, CT. I am finishing up undergrad at UConn and will be graduating in May with a degree in Physiology and Neurobiology. My goal is to eventually attend PA school. I am also a volunteer EMT in Ellington where I thoroughly enjoy giving back to the community. I am a die hard UConn Huskies basketball fan as well as a Patriots fan. I am very excited to be working at ASM where I can further my education in the EMS field. Information for the seventh new hire has been removed. 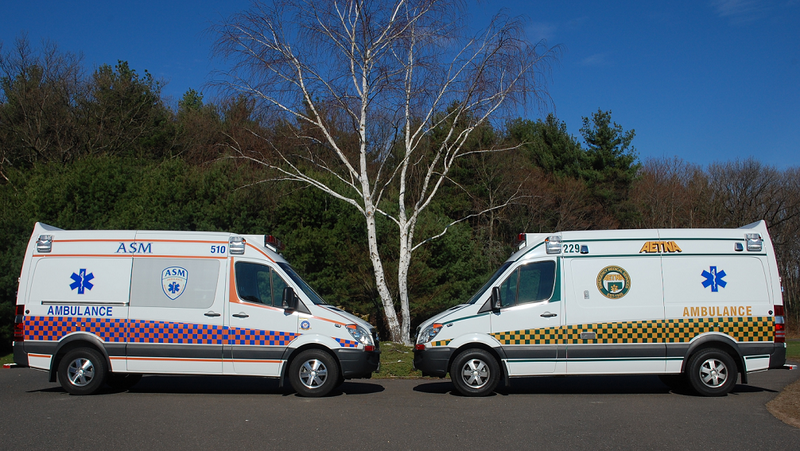 HARTFORD — On March 27, 2015 seven EMTs and two Paramedics were added to the Aetna team. As part of our continued growth Aetna and ASM seek out only the best candidates. We look for employees who are focused on high-quality patient care, are team oriented and conduct themselves in a professional manner. During the orientation, employees learn about company philosophy and goals, quality assurance, and policies and procedures. Raymond Berwick: FULL TIME, EMT. My name is Raymond Berwick and I am 21 years old. I currently live in Ellington, Connecticut. I was born in Vernon but moved from Connecticut to North Carolina at a young age and then on to Mississippi. I eventually ended up finishing out my high school years at Rockville High School, right here in Connecticut. As soon as I could hold a hammer I was building various things with my father. Naturally after high school I quickly became a carpenter. I joined the United States Army Reserve which is where I has my first contact with emergency medicine. I took a “combat life saver course” and immediately knew I loved it. Just the thought of helping people on one of the worst days of their life. Or the possibility of maybe one day being able to save one of my brothers or sisters in arms is amazing. I run a “small time hobby farm” which includes around 30 chickens and a few pigs. In my spare time I enjoy hunting, fishing, backpacking and camping. I cannot wait to explore this new chapter of my life and I am counting down the days until orientation. Israel Cardona: FULL TIME, EMT. My name is Israel Cardona Jr. and I am 23 years old. I was born and raised in Hartford, CT. I received my GED with Honors in 2011 and then graduated from Lincoln Technical Institute in New Britain for Medical Assisting. Since then I have worked for both U.S Security Associates and Allied Barton Security Services for the past two years now. I have worked primarily as security for the Phoenix Life Insurance company in Downtown Hartford. I started as a part-time third shift officer and I was fortunate enough to land a supervisor position within a year. While working at the Phoenix I attended the EMT-Basic course at Code One Solutions in East Hartford which was a great experience and made my decision to be an EMT one I would not regret. I went for my EMT-B certification because I love the challenges that the EMS field faces and know that it is a career that would always push me to learn more. Although I will miss my friends and coworkers at the Phoenix I look forward to working alongside the Aetna Ambulance staff for many years to come. Within the next year I hope to attend paramedic school to further my knowledge in the EMS field. Joseph Kosswig: FULL TIME, EMT. Hello my Name is Joseph Kosswig, I am 23 years old and from Plainville, CT. About five years ago years ago I joined the Volunteer Fire Department in Plainville. When I started there I completed fire school and loved helping people in their time of need. I enjoyed it so much I decided to continue my education and took an EMT-B course at New Britain EMS Academy. It was a fast course, full time over a span of a six week period in the Summer of 2013. During the time of this course I began to take on as much ride time with New Britain EMS as I possibly could, as a student. I loved helping the patients and knew I wanted to continue my career. During this time I have also been enlisted in the CT Army National Guard, serving as part of the Charlie Company in the 1-102 INF. I have been in the military for about five years now in which I have taken on the responsibilities of a Team Leader. I have also completed a couple of military courses such as Army Mountain Warfare School and Warriors Leadership Course. I have been a student at Tunxis Community College for a few semesters now and have only eight classes to finish my degree. I plan on finishing my degree and hopefully one day I become a Paramedic. I look forward to starting my career at Aetna Ambulance and becoming part of the greatest team. Muath Omari: FULL TIME, EMT. My name is Muath Omari, I am 27 years old. I am newly married and having my first born son this year. I thank Aetna for giving me the chance to start my new life with a wonderful new career with their company. I love helping people and love the emergency medical field. I am grew up in the streets of NYC most of my life. CT is my new home for my new family. I have work hard to achieve my goals. I have struggled through many obstacles in life to get to where I am today and plan to finish school as a paramedic. My life has changed for the better, but the man who loves football and cars will never change. Now I will look forward about teaching my son about all the things I learned in life and loved in life. Thank you to everyone at Aetna who believed in giving me a chance. Dennis Pelletier: FULL TIME, EMT. My name is Dennis Pelletier, I am 26 years old and currently live in Windsor, CT. I grew up in Coventry and joined the US Air Force right out of high school. I served five years in the Air Force in Security Forces and I was fortunate enough to travel around the world and live in Turkey and Guam for some time. My deployment to Iraq opened me up to EMS and I discovered I had a passion for it. Once out of the Air Force I started college and worked at Cabelas in the firearms section. I took my EMT class in the Summer of 2014 at Code One in East Hartford and I currently have an Associates Degree in Homeland Security from Goodwin College in East Hartford. I am also finishing up my Bachelors degree in Public Safety and Security at Goodwin. My ultimate career goal is to have a career in emergency management however EMS is not just a stepping stone, I see it as a career as well. I eventually want to get my Paramedic license and a Master’s Degree in emergency management with a focus on public health. 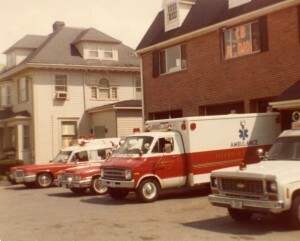 I am excited to begin a career with Aetna Ambulance and to provide a public service. David Rivera Jr: FULL TIME, EMT. My name is David Rivera Jr. I am 27 years old and currently reside in East Hartford, CT. I became a certified EMT about two years ago. I am a volunteer member of the Manchester Fire Department as a Firefighter/EMT. I have always been so interested in how the human body works and its functions. That small fire really burned within me when I went on my ride along with Aetna while working on my certification. Volunteering with the fire department and going on emergency calls just confirmed that this was what I wanted to do. Everyone in this world has a purpose/calling and I truly believe that this is mine. I am a new father to a beautiful baby girl. I will take care of every child as if they were my own. I will a care of every mom, dad, brother, sister, grandmother and grandfather as if they were my own. I spend my free time with my family, loved ones and two dogs. I give thanks to God as He is the rock in my life. My hobbies are working out, fishing and reading. I am blessed and thankful for this opportunity with Aetna and I look forward to the experiences and room for growth. Shawn Testa: FULL TIME, EMT. My name is Shawn Testa and I was born and raised in Bristol, CT. I am a six-year veteran of the United States Army. After graduating high school I joined the Army as an Airborne Infantry Medic and was stationed in North Carolina for four years. I was deployed for two combat tours in Afghanistan in support of Operation Enduring Freedom VIII and X with the 82nd Airborne Division. I was attached to an infantry company of the 508th Parachute Infantry Regiment and participated in daily patrols as the first line of immediate medical attention. Aside from battlefield medicine, I was responsible for clinical and daily care of the soldiers in my unit. The final two years of my military career were completed as a reservist in New York. After my initial enlistment I went to school and recently graduated from Tunxis Community College with an Associates Degree in Science. I enjoy spending time out doors and camping with my family and close friends. My favorite holiday is The Fourth of July. America! Information unavailable on ninth new hire at time post was published; a full time Paramedic. MANCHESTER and HARTFORD — Aetna Ambulance and ASM send Patient and Customer Satisfaction Surveys to a random sampling of patients who have received emergency or STAT inter-facility services from our companies. Fabulous. The service has always been great since my husband was alive with Alzheimer’s, He had many trips but always great care. I had great care when I needed it. (15-5753; G. Geres, M. Sparks). Excellent, timely, professional, caring service!! The paramedic was experienced, reassuring and very professional. (15-8589; M. Levasseur). The crew was very professional and sincere. Made me feel comfortable in a stressful situation. I was very pleased with the service and thank everyone involved. Efficient – Well Trained – Knowledgeable – Considerate. (15-9703; S. Norton, J. Hornish). Patient, caring, careful, good listeners staff. (15-8729; S. Whalen, N. Foran). As a director of health (retired) in a private school, I have used ambulance services for students, I can say with experience that the team who responded to me could not have been better. (15-10505; M. Osborne, N. Raiola with Manchester Fire Rescue EMS). Everyone was polite and friendly. Both were very wonderful to me. N. Raiola called my appt for me so I can cancel. I was very grateful for that also. Thanks so much. (15-11201; N. Raiola, G. Derosier). Thank you so much for your service!!! The ambulance crew was very professional and showed concern for my mother’s privacy. (15-9096; K. Stock, T. Halligan). MANCHESTER — On March 23, 2015 ASM’s Matt Tuttle was promoted to the position of Supervisor. 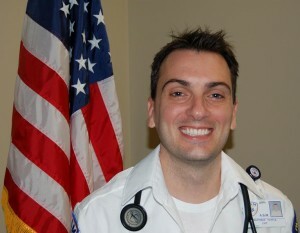 Matt started at ASM as an EMT-Basic in 2006. He graduated from the Capital Community College Paramedic Program and was cleared for independent dispatch in June of 2014. On behalf of the ASM Family we would like to congratulate Matt on his promotion and look forward to great things from and for him. We are very proud to have such skilled professionals on staff. Samuel Dybdahl (L) with Hartford Hospital’s Dave Bailey. HARTFORD – As of March 18, 2015, Aetna’s Samuel Dybdahl has been cleared by Hartford Hospital medical control for independent dispatch as a paramedic to the towns that Aetna serves. Sam’s preceptor was Paramedic Matt Campbell. The full precepting phase can take ten to 12 weeks or more as the paramedic is prepped for the realities of the field. 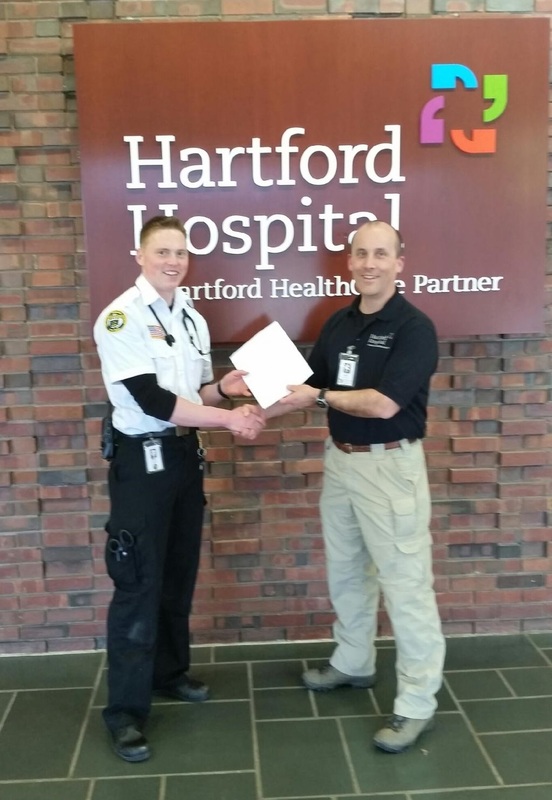 As with all precepting phases at Aetna, Sam’s final approval came from Hartford Hospital after shadowing him and his preceptor in the field as they responded to emergency calls. Sam has a bachelor’s degree in Business Administration, is a nationally registered Paramedic and received training as an Army Critical Care Flight Paramedic from University of Texas Health Science Center in San Antonio, TX. He is a combat medic and healthcare specialist in the military since 2008 with one deployment to Afghanistan. Sam says he enjoys helping others and furthering his knowledge within the medical field. In his spare time he often competes in Duathlon/Triathlons, road races and weight lifting. On behalf of the Aetna Family, we would like to wish Sam the best of luck and say we are very proud to have such skilled professionals on staff. 100% A+! They saved my life! (15-3354; M. Pacheco, S. Howard). Caring and considerate of special needs. Clients and facility. Friendly. My 3 y.o. love them. Called them her new friends. (15-5359; V. Maston, J. McAuliffe). Excellent. The EMT staff did a good job. They knew their job – Made me very comfortable. They were helpful and helped me to relax. Caring; dedicated; excellent. (15-4690; R. O’Neil, T. Luetjen). CARING. EMTs stopped back in ER after transporting someone else to check on me. Very thoughtful. (15-5397; T. Marshall, H. Marshall). Professional & friendly & reassuring. (14-108106; M. Osborne, D. Hammett). The crew [was] extremely courteous, efficient and very kind. (15-5316; J. Traber, W. Schnepp). Quick response time and professional [manner]. Crew very thoughtful + kind. Truck needs better suspension for bumps. Thank you! Couldn’t have been better! Professional but still compassionate. (15-2542; V. Maston, E. Vaughn, N. Raiola with Bolton Fire Department). Excellent care and service. Thank you so much. I really appreciated it. (15-6569; M. Tuttle, J. Startup with East Hartford Fire Department). Very polite + concerned – Cleaned ice + snow, so I could get on stretcher. I’m old + gray, they were very flattering, telling me I was good looking!! “So sweet”. (15-6482; B. McDonald, D. Tedeschi with East Hartford Fire Department). Professional, knowledgeable, timely, respectful. We were very impressed with the care our son received from your staff members. He is 2 years old and the way he was care for was amazing!! Thank you ALL for such great CARE!!! 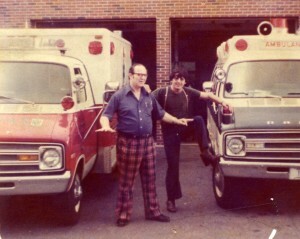 (14-106100; J. Roy, K. Baker with Manchester Fire Rescue EMS). KIND and CARING in a scary situation. (14-110624; G. Geres, B. Langan). Is knowledgeable, professional, attentive, compassionate. (15-519; V. Maston, G. Geres). The crew[members] were both professional and kind. Thank you both! (15-1109; R. O’Neil, B. Langan). A special thanks to John (presumably from MFRE) who recognized [patient] and made him feel comfortable. (15-1767; K. King, S. Boutot with Manchester Fire Rescue EMS). Knowledgeable, caring – top notch! (Answered Strongly Agree to all questions) I did not check off the survey without thinking about the questions. Your driver and paramedic were that good!! Thank you!! (15-2474; D. White, A. Pardi with Somers Fire Department). The [Paramedic] was very professional + kind. Both fellows were great. (15-3092; T. Oliver, C. Haag). Happy to have you around. Caring, thorough, and followed protocols. The staff was amazing. The medics were so thoughtful, attentive and informative. (15-2853; J. Bak, N. Raiola). Very nice medics. I am very happy that I had your medics. [H. Jolly] made me feel very comfortable. (15-3724; H. Jolly, J. Martinez). MANCHESTER — First responders who tried to save a man’s life Tuesday when he collapsed while shoveling his roof returned to the home after the man died to finish the job he started. “In all honesty, it’s not surprising, you know, the compassion of our community and our first responders, but this to me was just amazing,” police Officer Bernie Hallums said Wednesday. The emergency call from 12 Scott Drive came in at 9:45 a.m. Hallums said he and other police officers climbed a ladder to the roof and rendered life­saving aid, but the man remained unconscious and later died. Later that morning, Hallums, along with Officers Adam Desso and Tomas Kazcerski, firefighters from the town and Eighth Utilities District and Ambulance Service of Manchester medics returned to the home to finish shoveling the roof. MANCHESTER — Year unknown, likely early 1970’s. 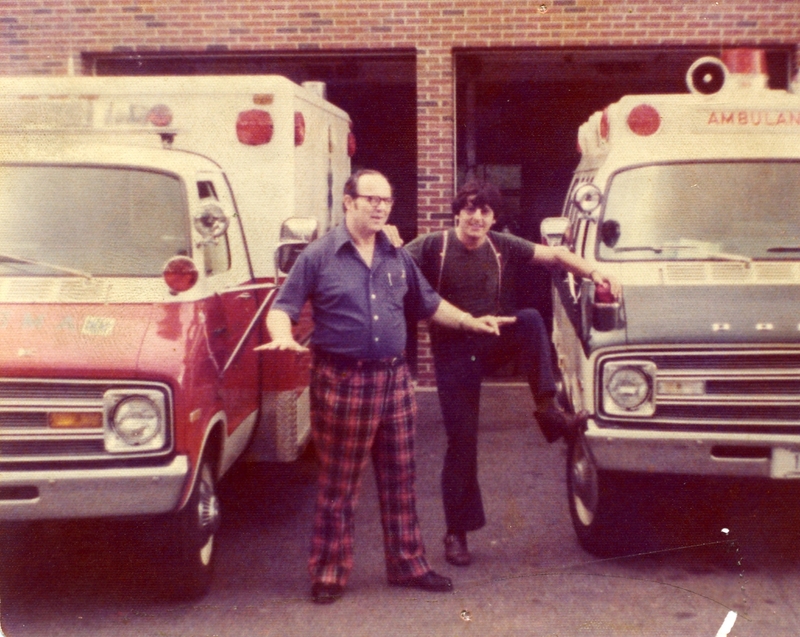 Pictured is Manchester Ambulance (now known as ASM) and its patriarch Roger Talbot in plaid slacks with employee and friend Frank Axiak who died in 2011. They are standing in front of the former headquarters on East Center Street. Did you work for Manchester Ambulance on East Center Street?